C. Pius Tetricus, one of the Thirty Tyrants, and the last of the prentenders who ruled Gaul during its separation from the empire under Gallienus and his successor. He reigned in Gaul from A.D. 267 to 274, and was defeated by Aurelian in 274. Tetricus along with his son Tetricus II, graced the triumph of the conqueror, was immediately afterward treated with the greatest distinction by Aurelian. Obverse: IMP TETRICVS AVG, Laureate and cuirassed bust left, holding spear over left shoulder and bearing round shield over left. Reverse: VIRTVS AVG, Emperor standing left, holding globe in right hand and parazonium in left; at his feet left, captive seated left. Obverse: IMP C TETRICVS P F AVG, Laureate and cuirassed bust right, drapery over left shoulder. Reverse: P M TR P II COS P P, Tetricus standing right, in military dress, holding globe and spear. Obverse: IMP TETRICVS PIVS AVG, Laureate, draped and cuirassed bust of Tetricus I to right. Reverse: P M TR P III COS P P, Fides standing left, holding legionary standard in her right hand and long scepter in her left. 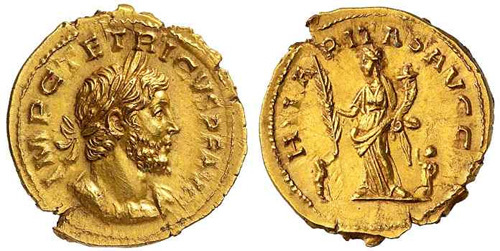 Reverse: P M TR P III COS II P P, Emperor, in military attire, standing right, resting left foot on globe and holding inverted spear in right hand and parazonium in left. Obverse: IMP C TETRICVS P F AVG, Laureate and cuirassed bust of Tetricus I to right. Reverse: HILARITAS AVGG, Hilaritas standing left, holding long palm branch in her right hand and cornucopia in her left; to left and right, child standing facing her, the one on the left grasping the palm branch and the one on the right, raising a hand to touch a fold of her drapery. Obverse: IMP TETRICVS P F AVG, Laureate bust of Tetricus I right draped left shoulder. Reverse: SAECVLI FELICITAS, Felicitas standing left holding patera in outstretched right hand over altar before, long caduceus in left. Reverse: VICTORIA AVG, Victory walking left, holding wreath and palm. Obverse: IMP C G P ESV TETRICVS AVG, Laureate and cuirassed bust left. Reverse: VICTORIA GERM, Tetricus, holding globe and scepter, standing left, being crowned by Victory, holding wreath and palm frond; to left at feet of Tetricus, bound captive seated left with head right. Obverse: IMP C TETRICVS P F AVG, Laureate and cuirassed bust right, with drapery on left shoulder. Reverse: VIRTVS AVG, Virtus seated left on cuirass, holding branch and sceptre.